I have done many different Christmas gifts for parents over the years. I used to buy wooden shapes--stockings, stars, gingerbread men, etc., at our local craft store, paint them, date them, then either put a magnet or a string on them. After some time, and the classes started growing, the expense started to set in. 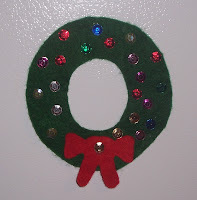 Later I made some really pretty wreath magnets from felt and sequins. I also put the date and the child's name on the back. Then I went on leave as a teacher for a while. (I think it was child number 4?) 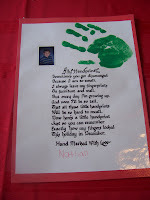 Anyway, the new teacher started doing a handprint poem for parents--it gets rave reviews, so I continued. 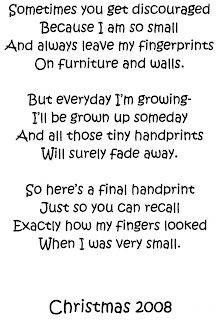 Many of you have probably heard the poem before, it starts: Sometimes you get discouraged, because I am so small, and always leave my fingerprints, on furniture and walls......(I have a copy of the poem below). Well I buy some pretty document sized paper, print a sheet out for each child, at the bottom I have their name and the Christmas date. 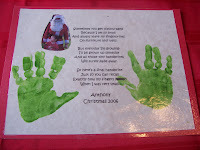 Then I will have them put a red, green, or red and green, handprint on each side of the poem. We then "wrap" these for Mom and Dad. Our wrapping usually consists of using a 12 x 18 piece of paper folded in half and taped up the sides. I have the children decorate the outside, by stamping, coloring, cutting, etc., and writing their names. Then when their gift dries we slide it inside. We then present the presents on the last day of class. I actually have all of my children's gifts still. I always added a picture of them that year and then laminated them on my own. They are quite a keepsake. I have been looking everywhere for this poem. I received a similar gift from my now ten year old son when he was smaller and I loved it. Thank you very much for your great idea. Merry Christmas. I'm so glad I was able to help. Enjoy and Merry Christmas to you! Check out these awesome parenting tips about the permissive parenting as well as uninvolved parenting style and much much more!